Working from horseback, a fulfillment of dreams. Together we ride, for together we're bold. For it's you underneath me, that makes this job fun. From you I will gather, all of my fortitude. And when we're greeted by others, the one they speak to is you! An Officer on horse back, we'll help save the day. Together we'll ride, together, in love." You nicker so softly, as I bring you your hay. The love from my partner, will help see us through. But the strength on my back, says I've nothing to fear. It's your strength that sustains me, when I could run and hide. Sometimes I sure need them, because I won't budge. An Officer on horseback, what a beautiful sight! But just look at that grass, it's just under my feet. We'll work as one forever, I'll feel you in my dreams. I'll rest till that time, we again will work mounted. 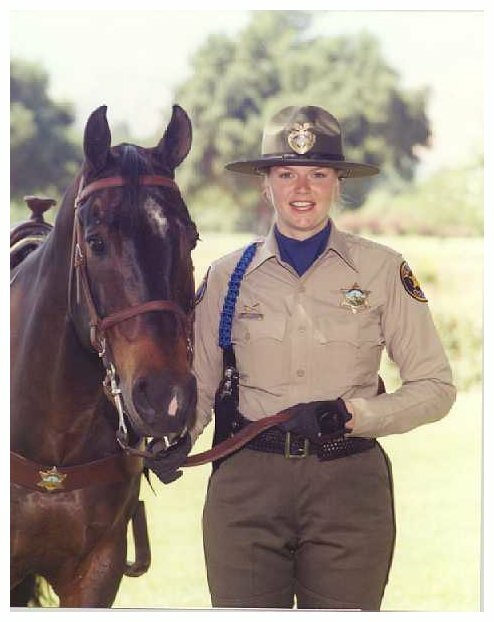 Senior Deputy Whitney was struck broadside in an un-marked patrol vehicle while on duty. The suspect had traveled through a controlled intersection during a power outage without regard to other traffic present. The individual who struck and killed Lisa was found guilty of Felony Vehicular Manslaughter while under the influence of methamphetamine (speed). February 17, 2000 - Ms. Pittman received the maximum possible sentence, 8+5 = 13 years. The additional five years was an enhancement. She is now a 2 striker, she must do 85% of the time, and then 4 years of parole. She will be housed at Chowchilla State Prison.